Party Party is a new sensation from Latin Dance Store. This new line of shoes provides trendy, fashionable club dancewear & clubing shoes. 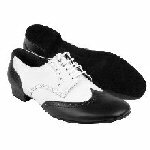 Unlike other traditional "same look" ballroom or latin dance shoes from other manufacturers, Party Party clubbing shoes are desigined locally by Californian fashion shoes designers and approved by professional dancers before manufactured.